I have a project that I’ve been waiting for months to share with you! One sweltering day last summer, I went on a junkin’ trip with my friend Amy from Atta Girl Says. We both found lots of treasures that day, but we were on the lookout for something we could use for a project for the Chic Chateau Showhouse. Don’t remember what that is? It was a designer decorated showhouse where the proceeds benefited a local charity. The whole premise behind the decor was “repurposing and upcycling”. Everything was for sale at the end of the show for great prices. Take the full tour HERE if you haven’t seen it. There are tons of ideas to inspire you. Back to the project. Amy wanted to repurpose a changing table into a potting bench, which you can see above. Isn’t it just the most adorable thing?!?! Click HERE to see how she accomplished the amazing transformation. I wanted to make a garden clock that could be displayed along with the potting bench. I had a vision in my head. 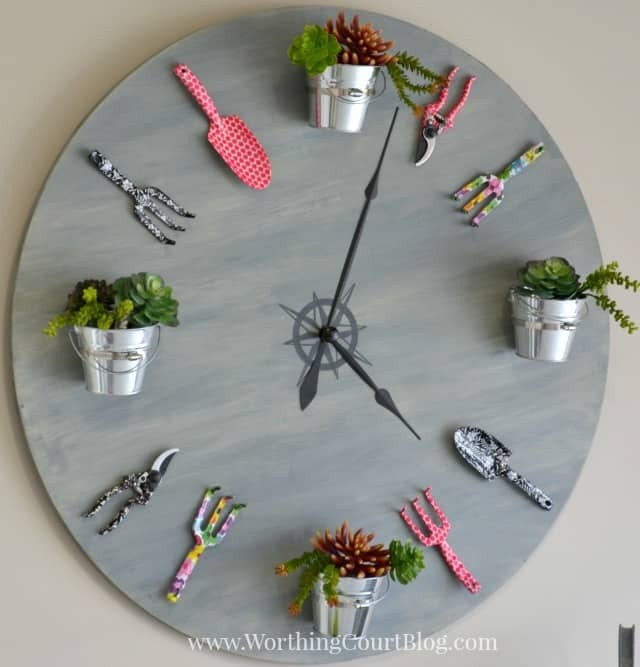 Instead of a clock with rusty, crusty gardening tools, I wanted it to be bright and cheerful. Thus my choice for new and colorful gardening tools to be the “numbers”. I found them at Tuesday Morning. I wanted it to be a living clock too. 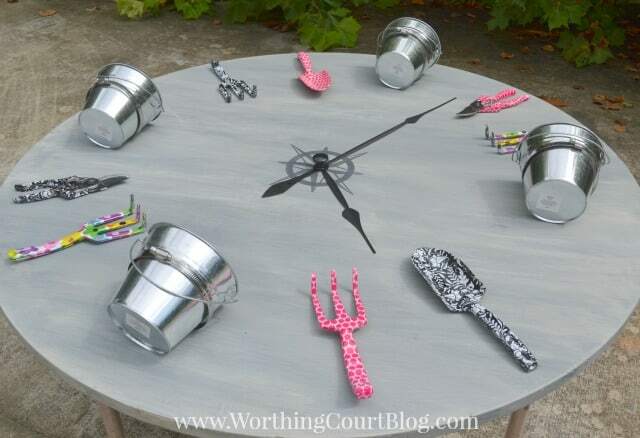 So instead of a gardening tool, I placed a galvanized bucket at the 12, 3, 6 and 9 positions on the clock face. If I were making it for myself, I would have put live plants into the buckets, but since this was going to be in showhouse for two weeks (and couldn’t be watered), I opted for some faux succulents to fill my buckets. 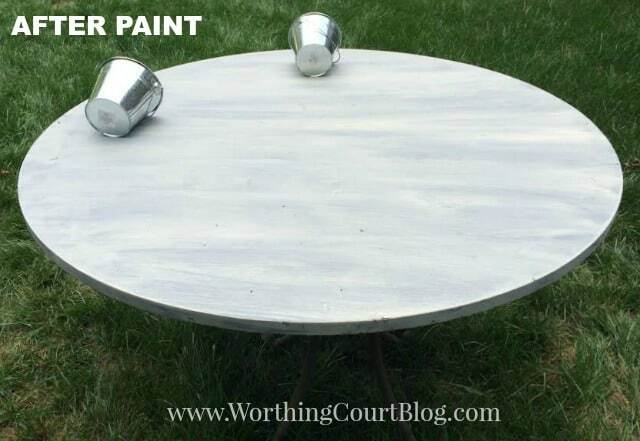 I had assumed that I’d have to use an old pallet or reclaimed wood and was dreading trying to cut a perfect circle, but we came across an old tabletop for $5 – perfect! 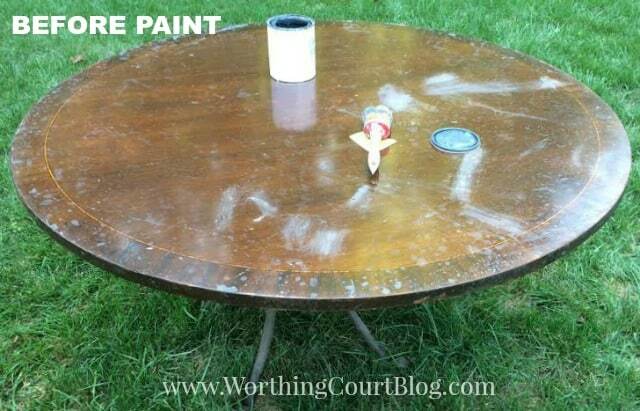 At the time, we had our old house up for sale and renovations were going on at our new house, so there was no place for me to set up to paint to create a faux weathered finish on the tabletop. Fortunately, Amy volunteered to help me out by taking the table to her house to paint. Amy applied a base coat of gray chalk paint, then topped it off with a some watered down white chalk paint to achieve the look I was after. And then that puppy came home to me so that I could finish it up! Here are the supplies that you’ll need. 1. 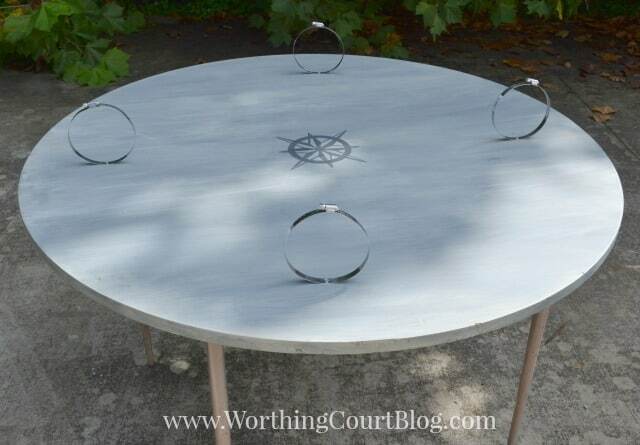 BEFORE painting, attach a “D” ring hanger on each side of what will be the back of the clock. Make sure they are placed more than halfway to the top and that they are perfectly straight across from one another – or else your clock will hang crooked. 2. Paint the clock face. Apply/paint the compass in the exact center. I chose not to use the N, E, S and W letters. 3. Taking into consideration the location of the “D” ring hangers, attach the pipe clamps at the 12, 3, 6 and 9 positions, using a screw to attach each one to the clock face. Adjust their opening to fit the circumference of your pots. Here’s how it looked while I checked the opening of the pipe clamps against my buckets. 4. I don’t have a picture of this, but paint the wood knob black. It will be used to look like it is what’s holding the clock hands. Using the epoxy, glue the hands to the center of the compass medallion and then glue the knob to the top of the hands (where the hands would normally be attached). 5. Without gluing, place each piece where you want it to go. It’s best to do this before gluing because you’ll probably have to make adjustments. 6. Glue the gardening tools in place and fill the pots with plants. You’re done! I could have made my clock fully functional with the addition of a clock mechanism, but I chose not to in case someone wanted to hang the clock outside on a porch or on the side of the shed. Do you think that you’d like to make one? Hi Bev. I’m not an expert, but all of the clock mechanisms that I’ve seen do stick out the back. The hole that you would drill into the face of the clock would just be large enough for the stem that holds the clock hands to stick through. (Think about how tabletop battery operated clocks look on the back.) To offset the amount that the mechanism sticks out the back, I would attach a board to the top and bottom of the back of the clock that is the same thickness as the mechanism. I would cut each board to be a few inches narrower than the width of the clock at the top and bottom. That would allow the clock to still hang flush against the wall. Hope this makes sense! I’m with Barb…..your clock certainly stoleed the show in your show house garage as it consumed your attention the moment you stepped into the space. It was an awesome find for whomever ended up with it. Great job!!! 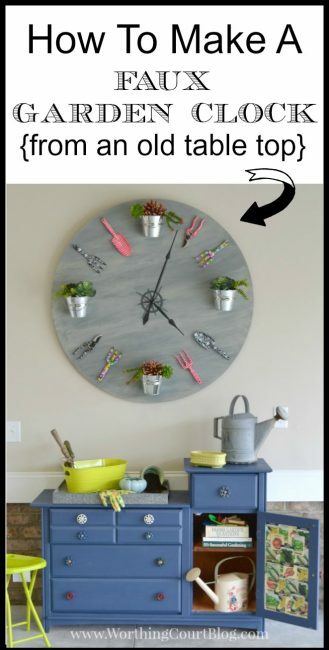 Suzy, I love this tutorial on how to make a garden clock. It is calling my name and will definitely be on my to-do list for the summer. So clever! I can’t even express how much I love and adore this clock!!! Just fun and cheerful and colorful and it makes me smile!!! Pinning away! Oh, Suzy!!!! How this speaks to my crafter’s heart! Adorable! Pinning! Suzy, I expect to see this project featured in a garden magazine! It’s fabulous and now I must have a garden clock, too! This piece is seriously SOOO much fun! I love it!! 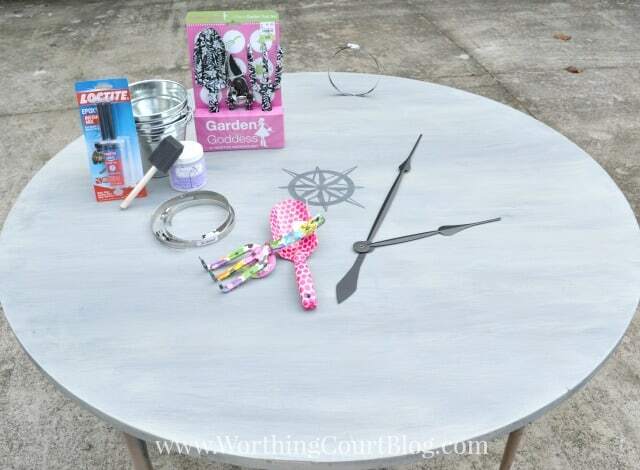 Suzy, thank you SO much for sharing your garden clock with us over at Shabbilicious Friday! Is t is such a smart idea and adore how it turned out – that’s why I’ve chosen your project as one of our features this week 🙂 Hope to see you at the party tomorrow! So cute! And what a great tutorial! I would love for you to stop by my blog and join our Something to Talk About link party Monday’s- Thursday! Hi Jodie. I’m TERRIBLE with a jigsaw, so I was really glad to find another solution. So glad you like the clock! This is so much fun! I would have never ever thought of this, but I love it! I like that it doesn’t require lots of power tools too. Something I can actually do! This is so pretty and creative! I really love how it turned out! 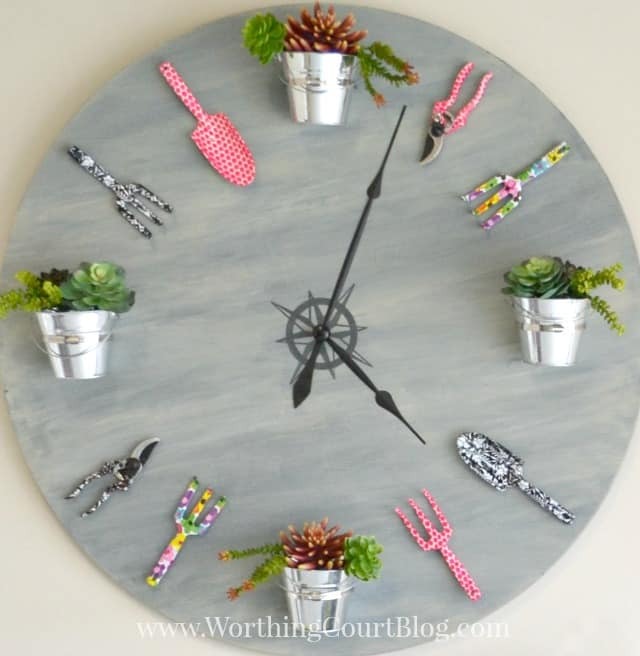 I love the little planters and the brightly patterned tools you added to your clock! So much fun! This is fantastic! 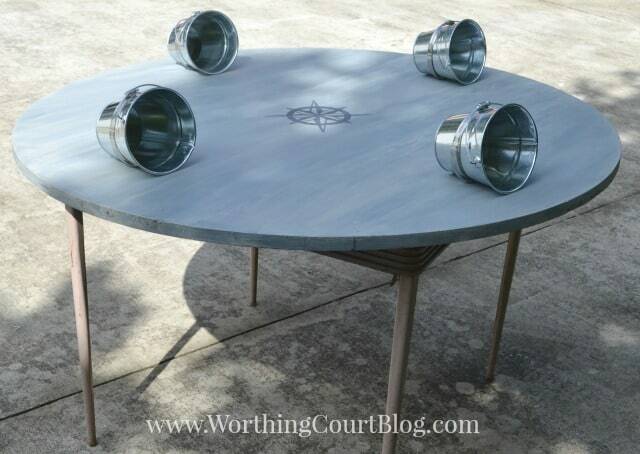 I have never even thought of doing something like this for outdoor decor. Super excited to try it out! Thanks for sharing! What a fantastic project! I love the garden clock, Pinning. I love your garden clock! I wish I had a dedicated gardening corner at my house! This would definitely be on the wall! I am getting ready to start hosting a new link party with Refresh Living starting this coming Tuesday @ 7pm CST. We would love to have you join us! This is so pretty and so creative. I absolutely love what you have done with it. I totally want to make one for my front porch. Thank you for sharing at Motivational Monday Link Party! Hope to see what you have been up to again this week. I love this so much! I need to make one for my porch or the side of my shed. It would be perfect! Thanks so much for linking up to The Creative Exchange. We will be featuring your project this week. This is so cute! I love it. Thanks for sharing the tutorial st the party! Pinned & shared. Hope to see you again soon. OMG, I love this idea! I’ve been thinking of something to put up on my shed. No more, I’ll be making this in the early spring to enjoy throughout the planting season!!! Thanks for the great idea, again!